The pressure is on Allister Coetzee after a disastrous 2016, but the Munster boss says he is staying put. 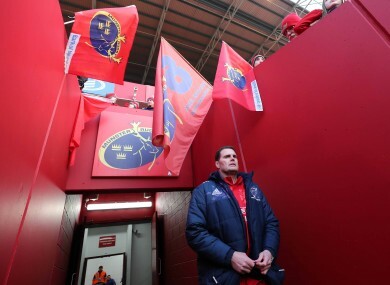 RASSIE ERASMUS HAS dismissed any suggestion he might be leaving Munster and heading back to South Africa to take over from beleaguered Springboks’ coach Allister Coetzee. The director of rugby yesterday put to bed any notion that he is being lined up for a return to his native country and confirmed that his future is with Munster, where he is in the first of a three-year deal. Just over a fortnight ago his lawyer back in South Africa Frikkie Erasmus told media there that reports linking the 36-times Springbok with a return home. And yesterday, Erasmus, speaking at a media briefing in Limerick, confirmed that his future is with Munster, who he has guided to top of the Pro12 and into the quarter-finals of the Champions Cup since taking over in the summer. “There is so much speculation with things normally at this time of the year with players, but I just think the South African set-up is obviously going through a little bit of a rough patch which they will definitely get out of, I am pretty sure they will. He has enough on his plate to deal with at the moment with 14 of his players away with the Irish squad, while a couple of the young guns Bill Johnston and Calvin Nash are juggling duty with the Irish U-20s and Munster. Erasmus, who is preparing for a Pro12 clash with the Dragons in Cork on Friday evening, said that while some players may return from the national set-up he is working on the basis that he might have none of them. And he said he is pleased that Ian Keatley’s form has been rewarded with a call-up as the uncertainty around Jonathan Sexton continues. “We are planning with the idea that we are getting nobody back. That’s the best way to do it because you’re never quite sure with guys doing fitness tests. Their major training session is on Tuesday so we will train with the mind that we have none of them available. “Ian has done well for us this year. He himself told me that he went through a rough season last year and so it was nice that he won games for us this year with drop goals and important penalties. “He has helped out at full-back, at 12, even 9. He’s a guy who is always positive and I’m always happy when a player gets an opportunity like this,” added Erasmus. Email “'I am definitely not in the mix': Rassie commits to Munster despite Springbok struggles”. Feedback on “'I am definitely not in the mix': Rassie commits to Munster despite Springbok struggles”.